Spectral Profiler (*1) onboard on Japanese lunar explorer SELENE/Kaguya revealed the global distribution of olivine (*2) on the lunar surface and its origin. This new finding provides us important insight into the Moon’s origin and evolution. This result was published in the British scientific journal "Nature Geosciences" on July 4, 2010. Spectral Profiler onboard SELENE/Kaguya has obtained about 70 million spectral reflectance data on the lunar surface. 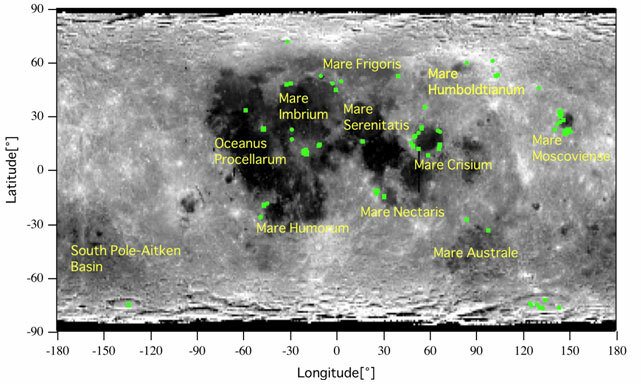 From the analysis of obtained spectra focusing on olivine's absorption band at 1.05 micrometer, 31 olivine-rich sites were newly found on the Moon (about 250 observational points) (Fig. 1). Most of sites previously reported as olivine-rich are not true. Total 34 olivine-rich sites, including three sites previously reported, are limited to concentric regions of large impact basins which are located on the relatively thiner crust of the Moon. There is no olivine-rich site on the thicker crust nor the central peak s(*3) of intermidiate-size craters, which were considered to often possess olivine (Figs. 2 and 3). It is therefore suggested that olivine of these sites originated from the deep-seated lunar mantle (as deep as 100 km) which were excavated by gigantic impacts of huge meteoroids. Furthermore, detailed investigation suggests that reflectance spectra of olivine-rich sites are consistent with dunite, which is considered to originate from the lunar mantle, but not with troctolite, which is considered to be embedded in the lunar lower crust. This result also supports the mantle origin of olivine. (*1) Spectral Profiler (SP): SP is a spectrometer observing the lunar surface to determine mineral composition on the lunar surface. (*2) Olivine: one of silicate minerals, and dense (heavy). The mantle in the Earth is composed mainly of olivine. (*3) Central peak: intermediate-sized craters with diameters of 20-180 km on the Moon possess a hill at the center of the crater. This is thought to be composed of rocks uplifted from deeper regions after an impact of a meteoroid. Olivine, one of silicate minerals, is thought to be one of the main components of the lunar mantle. Since dense (heavy) olivine tends to sink into deeper regions of the Moon, it is usually difficult to observe olivine on the lunar surface. On the other hand, it is expected that gigantic impacts of huge meteoroids excavate the deep-seated mantle, exposing it to the lunar surface. Thus, the distribution of olivine and its origin is a key factor to understand the lunar interior structure including the mantle and its evolution. However, the reports of olivine on the lunar surface by Earth-based observations and by spacecraft mission were very limited to date, and it is unclear whether the origin of the observed olivine on the lunar surface is the mantle or the magma from the lower crust of the Moon. The team led by Dr. Tsuneo Matsunaga (Center for Global Environmental Research, National Institute for Environmental Studies) has obtained more than 70 million spectral reflectance data of the lunar surface by Spectral Profiler (SP) onboard SELENE/Kaguya. SP is a hyperspectral instrument with high spectral and spatial resolution and wide spectral coverage. The mineral composition of the lunar surface can be determined by identifying diagnostic absorption features of minerals in SP spectra. Dr. Satoru Yamamoto of the team analyzed all the SP data, focusing on olivine's absorption band at 1.05 micrometer, and newly found 31 olivine-rich sites (about 250 observational points) on the Moon (Fig. 1). This analysis also revealed that most of sites previously reported as olivine-rich sites are not true. Total 34 olivine-rich sites, including three sites previously reported, are limited to concentric regions of large impact basins which are located on the relatively thinner crust of the Moon. There is no olivine-rich site on the thicker crust. Furthermore, although the central peaks of intermediate-sized craters were thought to often possess olivine-rich materials, the SP data showed that most of such craters did not have olivine on their central peaks (Figs. 2 and 3). These results suggest that olivine exposed on the Moon originated from the deep-seated mantle (as deep as 100 km), which were excavated only by gigantic impacts of huge meteoroids. Furthermore, detailed investigation of obtained spectra suggests that reflectance spectra of olivine-rich sites are consistent with dunite, which is considered to originate from the mantle, but not with troctolite, which is considered to be embedded in the lunar lower crust. It is therefore suggested that the origin of olivine found by SP is the lunar mantle. The reason why there is no olivine-rich site in the central regions of large impact basins is that olivine could have sunk in a layer of melted materials produced by gigantic impacts and/or the center regions of the basins are filled with basaltic lava that erupted later (Fig. 4). The lunar magma ocean hypothesis suggests that at the later stage of crystallization of the magma, there are KREEP rocks with radiometric elements, which are sandwiched between the crust and the mantle. Thus, the gigantic impacts of huge meteoroids would have excavated not only the mantle but also KREEP rocks, exposing it to the surface. However, previous remote-sensing data showed that, while KREEP concentrated onto large impact basin structures on the near side of the Moon (Mare Imbrium and Oceanus Procellarum), there is no KREEP at Mare Moscovinese nor Mare Crisium, which possess a large number of olivine-rich sites. This suggests that the large-scale transportation of KREEP into the near side or the deeper interior of the Moon may have occurred before the two impacts basins were formed. These findings give us an insight into evolution of the Moon's mantle, and Earth-like solid bodies in the Solar System. The team composed of researchers who belong to National Institute for Environmental Studies (NIES), Japan Aerospace Exploration Agency (JAXA), and several universities and research institutes. 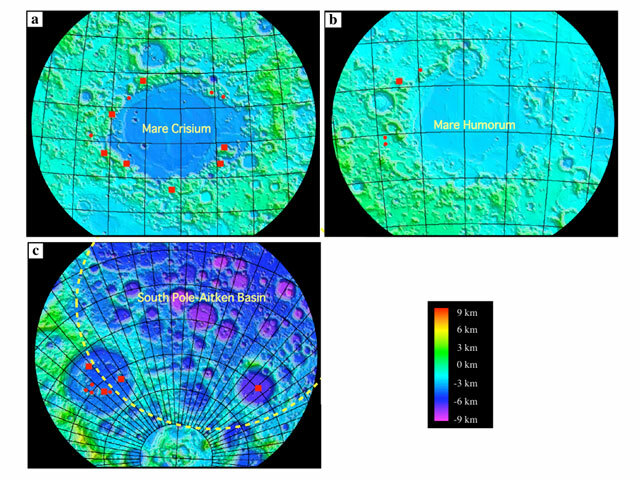 "Possible mantle origin of olivine around lunar impact basins detected by SELENE"
Fig. 1: Global distribution of olivine-rich sites (green). The background is a reflectance map in red color ( 0.75 micrometer) obtained by SP. The black parts are "mare", which is filled with basaltic lava. Longitudes ranging from -90 deg to 90 deg corresponds to the near side of the Moon (facing to the Earth) and the rest corresponds to the far side of the Moon, where we cannot see directly from the Earth. Fig. 2: Relation between the global distribution of olivine-rich sites (red points) and the lunar crustal thickness. The latter is based on SELENE gravity and a topographic model, which was obtained by Kaguya laser altimeter and four way Doppler measurements with relay satellites. The regions in purple to blue correspond to thin crustal regions, and yellow and red correspond to thicker regions. Fig. 3: Local distribution of olivine-rich sites around various basins or mare. (a) Mare Crisium, (b) Mare Humorum, and (c) South Pole-Aitken Basins (Yellow curve indicates the edge of this basin). Fig. 4: Schematic diagram of the impact basin formation and the mantle excavation by an impact. While the central region of the basin would be covered with melted materials and basaltic lava that erupted later, the rim region would not.